I started working out the summer before my junior year of high school. Not long after that Dan Lurie opened a show room right across from the school at 219-10 South Conduit Avenue Springfield Gardens, NY. Which I went to all the time and bought equipment, supplements, books and back issues of Muscle Training Illustrated magazine. I still have some Dan Lurie weight plates and the lifting belt I bought over 30 years ago! Also the first gym I ever joined was originally a Dan Lurie's Gym at 230 Hempstead Ave, Lynbrook, NY, which was bought by Richard A. Barathy of American Combat Karate fame and he changed the name to RAB's Gym. There was dojo in the back and a great old school gym in the front full of Dan Lurie equipment, plates, etc. I still world love to get my hands the Lurie Pec Deck machine they used to have there, it was one of the best I've ever used before or since. Dan lived in North Woodmere, which was only one town over from Rosedale where I grew up. 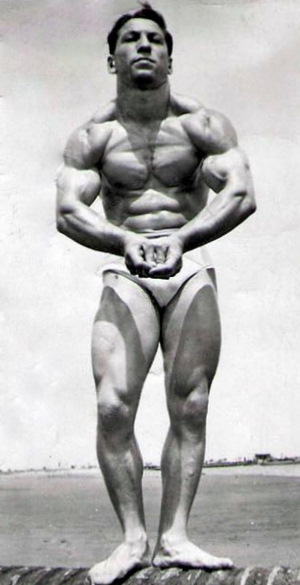 I used to see him at his store and around town and thought of him as the east coast Joe Weider. Later after he retired I got to know him even better and we talked by email and phone, he would call me "The Rosedale Kid". One of the last times I was in NY I went to visit Dan at his home, and we sat and talked for a few hours about the old days, the present, etc. He also showed me some magic tricks, which he was quite good at. Today I am saddened to hear about his passing. But also realize he lived to 90 years old and had a rich, full life. Not only did he rub elbows with all the top bodybuilders for over six decades, but also movie stars and many other celebrities. The man even arm-wrestled with President Regan! He was even a TV star in his own right, appearing on Sealtest Big Top Circus Variety Show on CBS as "Sealtest Dan, The Muscle Man". I hope to live as long and have as rich a life as Dan, and will continue to live by his words "Your Health is your greatest wealth".